Samsung is rolling out an update for Samsung Pay that lets Indian users pay their mobile bills, electricity, DTH and utility bills from within the app itself. It also lets users save bank account and IFSC details of their friends for money transfer via UPI. Samsung is updating its Samsung Pay app in India, which wouold give users more option. SamMobile reports that with the update, users can now pay their monthly bills from inside the app itself. This includes mobile bills, electricity, DTH and utility bills. In addition, users can also save bank account and IFSC details for their friends for money transfer via UPI. To recall, Samsung launched Samsung Pay in India back in March this year. The service also allows users to integrate with UPI and Paytm wallets. Samsung Pay supports both NFC and MST (Magnetic Secure Transmission), that makes it compatible with traditional and NFC-based card readers. At launch, the service supported cards from most major banks such as American Express, Axis Bank, Citibank, HDFC Bank, ICICI Bank, SBI and Standard Chartered. 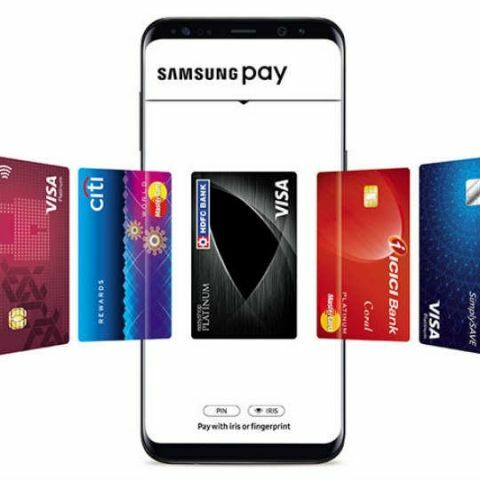 In order to make payments via the app, users will have to select the card they want to use and authenticate via their fingerprints or Samsung PIN. Those using a Galaxy Note 8, Galaxy S8 or Galaxy S8+ can authenticate via the retina scanner. Once authentication is complete, they can place the rear of the device on the payment terminal to complete the transaction. The system can be used at any merchant or retail store that offers a POS machine, card reader or NFC-based payment terminal. For security, the app comes with features such as digital tokenization, default encryption for card data via Samsung’s own KNOX security suite. Currently, Samsung Pay is only supported by select Samsung devices. For low power devices like the Galaxy J7 2015, Samsung offers Samsung Pay Mini, which doesn’t store card date, but allows for payments via Paytm, and UPI. How to pay the payment in online shopping festival? How exactly does Apple Pay work? Which apps that actually pay money to us?